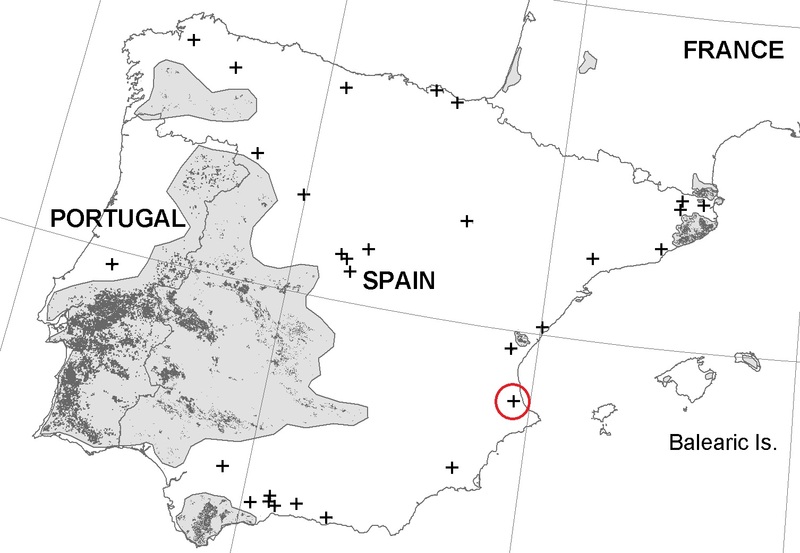 In early August a wildfire ignited by a lightning burned about 3200 ha, affecting mainly the municipalities of Lutxent, Gandia and Pinet (in Valencia, Spain). 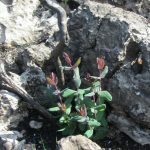 One month later I visited the area, and below are the main plant species that were already resprouting. 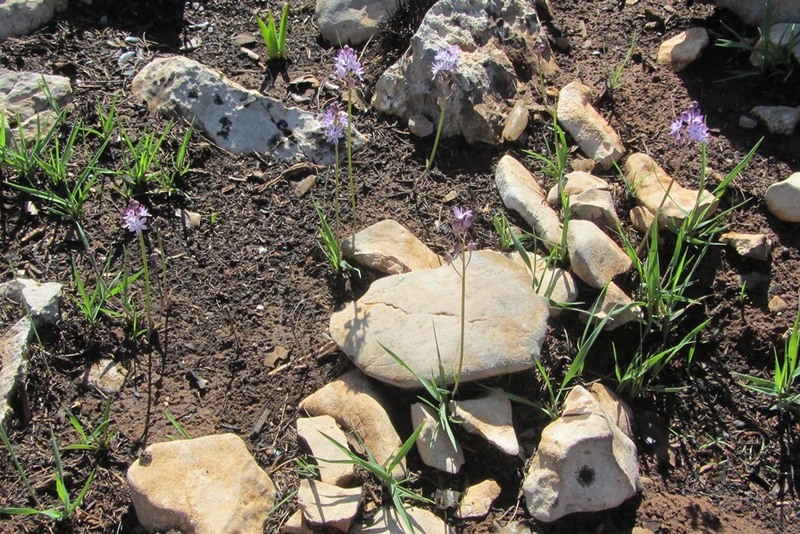 There were also two species already flowering, both geophytes: Urginea (Drimia) maritima and Scilla autumnalis; they showed flowers but not the leaves (they are protanthous: flowering before the foliage appears ). There were also many seedling germination from the seedbank, but they were too small to identify. The area affected by the fire include a small marginal population of Quercus suber (cork oak; el surar de Pinet) that we had studied few years ago . This oak was also resprouting (epicormically). Thanks to E. Laguna for his help on the species identification. 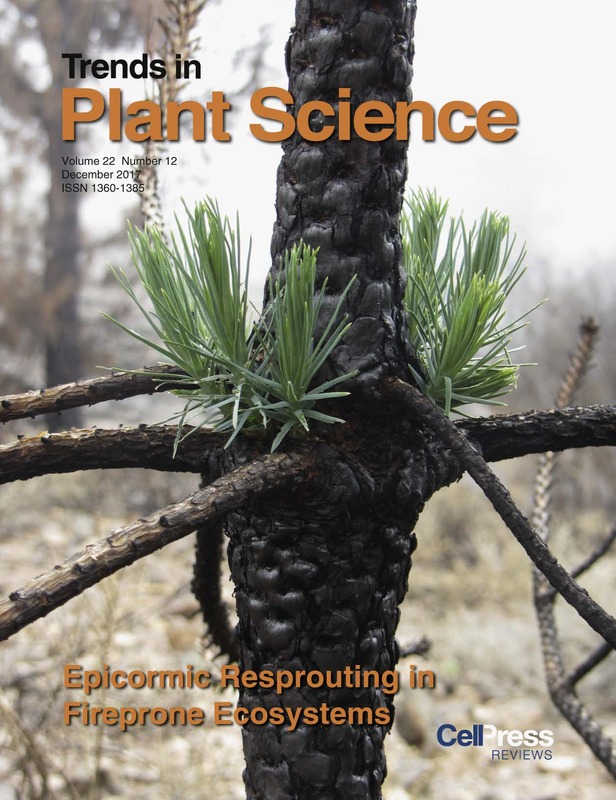 The cover of the December issue of Trends in Plant Science (22:12) is a picture of Pinus canariensis resprouting epicormically (from stem buds) 3 months after a fire in Tenerife (Canary Islands, Nov 2012). 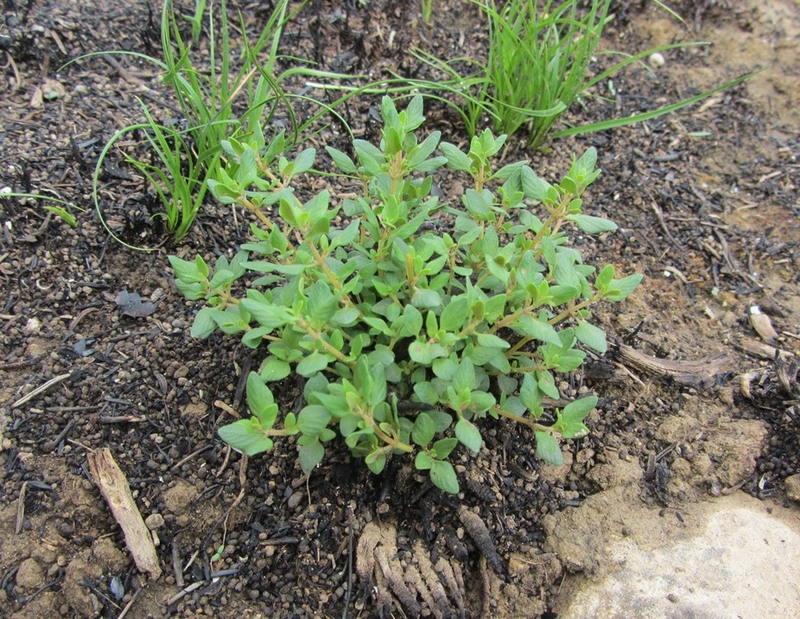 It features our review paper on this type of resprouting . 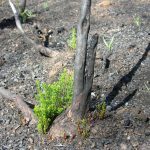 Many plants resprout from basal buds after disturbance, however epicormic resprouting is globally far less common, and the Canary Island pine is a very good example; it resprouts in this way even after intense crown fires. Some trees species, like many Eucalyptus, resprout from a lignotuber (a basal burl ) when young, and from epicormic (stem) buds  at the adult stage. This seems also the case for Juniperus deppeana (alligator juniper), at least the ones from the Trans-Pecos region, Far West Texas, USA. 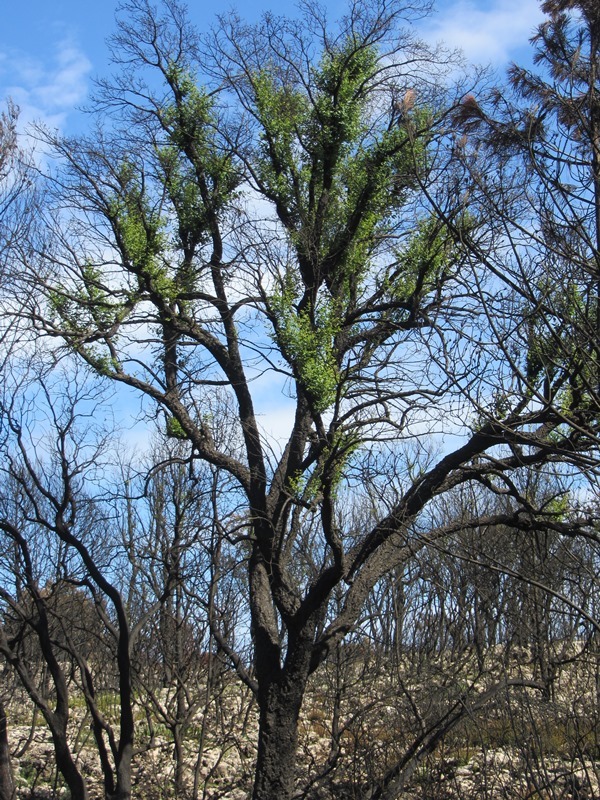 Big trees can survive surface fires (Fig. 1a below) thanks to their relatively thick bark (Fig. 1b). 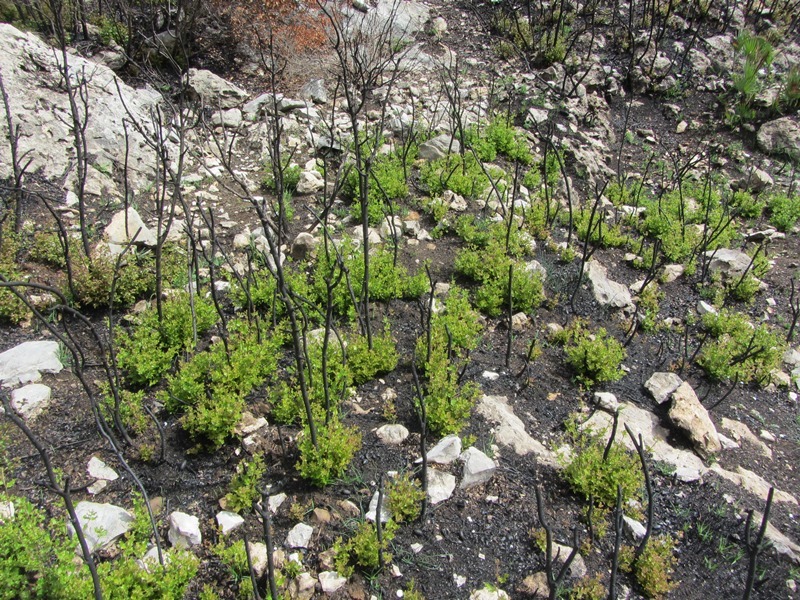 In the upper part of the Guadalupe mountains, a fire in May 2016 spread throughout the surface, crowning in some specific spots. 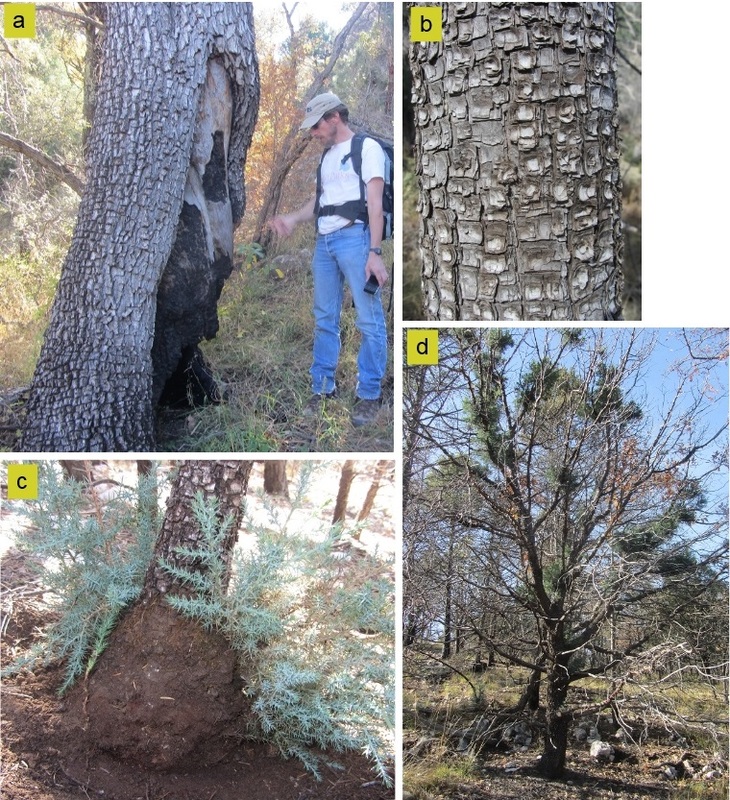 In these areas, smaller trees were resprouting from lignotubers (Fig. 1c) while large trees were resprouting from epicormic buds (Fig. 1d). In this dry forest in Guadalupe, Juniperus deppeana is abundant; in addition, two other conifers relatively rare in Texas are also common: Pinus ponderosa and Pseudotsuga menziesii (Douglas fir); many of the large individuals of the latter species were dead from a recent drought previous to the fire. 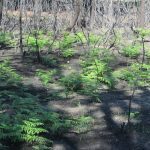 The forest also included some oaks, both tree and shrub oak species, and an understory with grasses, Agave and Dasylirion species. Figure 1. 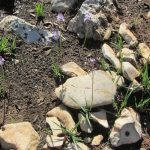 Photos of Juniperus deppeana (alligator juniper). a) A very large juniper with fire scars from surface fires (and Dylan Schwilk, Texas Tech University, in front of it). b) Detail of the bark. 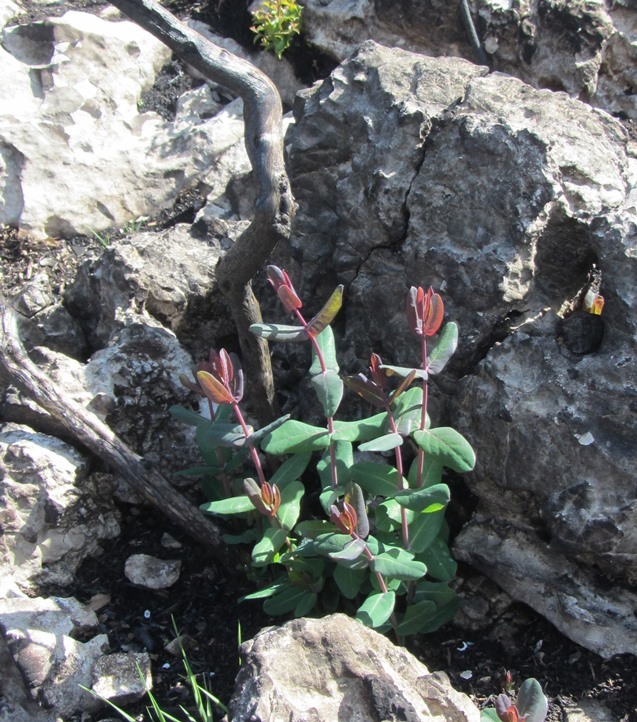 c) Basal stem excavated to show that postfire resprouts originates from a below-ground bud bank, a lignotuber. d) Postfire epicormic resprouting. Photos a) and b) from Davis Mountains, c) and d) from Guadalupe Mountains (1.5 years after a fire), Trans-Pecos region, Texas, November 2017. 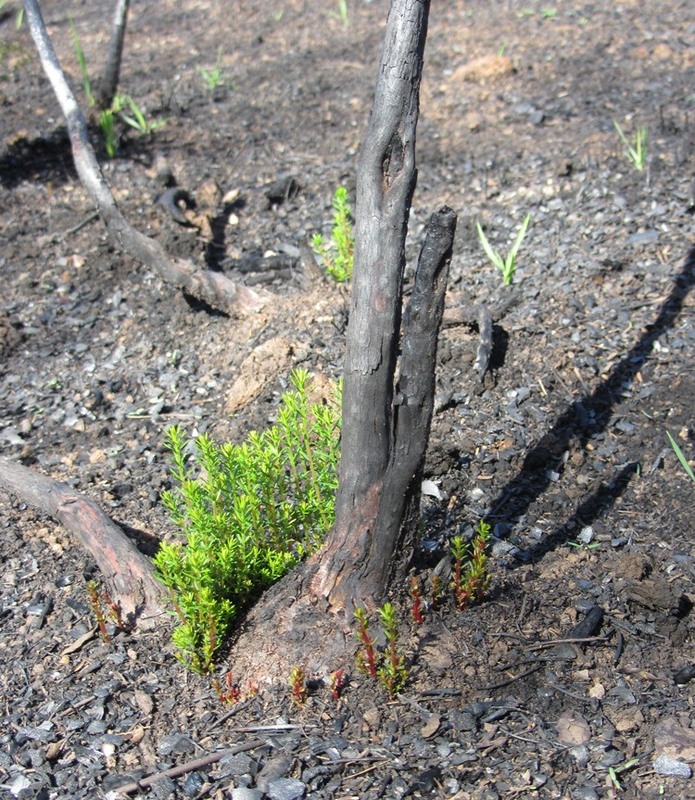 Many plants resprout from basal buds after disturbance, and this is common in shrublands subjected to high-intensity fires . 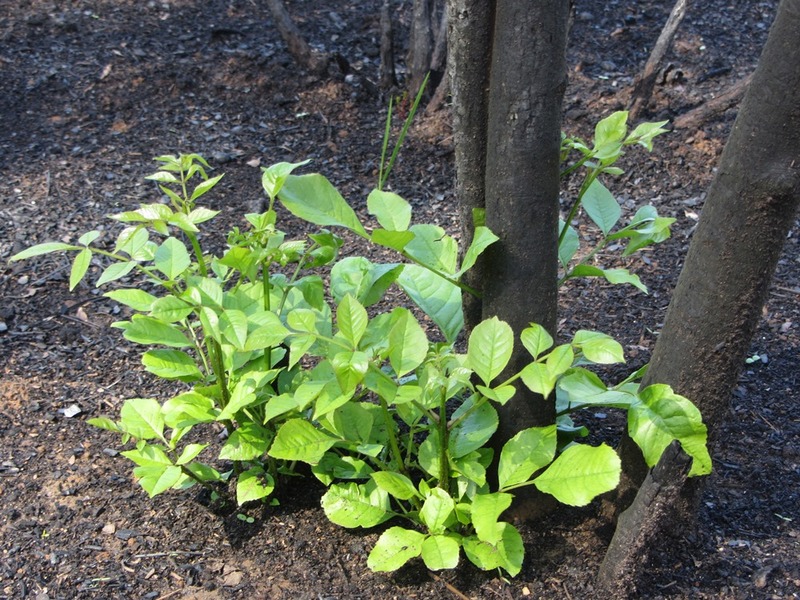 However, resprouting after fire from epicormic (stem) buds is globally far less common. In a recent paper we review the ecology and evolution of this mechanism . 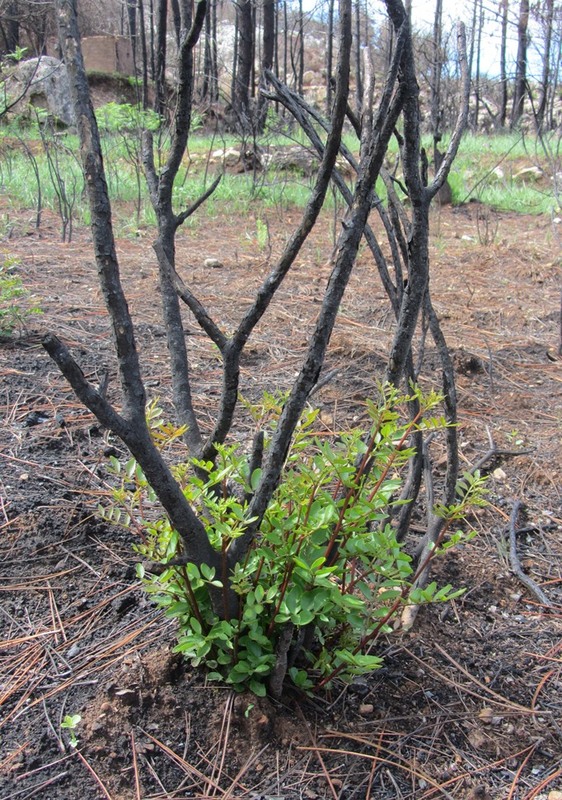 Many plants can generate epicormic shoots after light disturbances (e.g., browsing, drought, low intensity fires, insect defoliation, strong winds), but this does not mean they generally resprout epicormically after fire, as the heat of a fire may kill epicormic buds if they are not well protected (e.g., by a thick bark). The most well-known examples of epicormic resprouting are many species of eucalypts (Fig. 1A below), the cork oak (Quercus suber , Fig. 1B below), and Pinus canariensis (, Fig. 1C, D below). 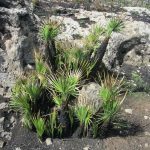 There are other pines and oaks that also resprout epicormically, and many species from savannas, especially those from the Brazilian savannas (cerrado) where many trees have a thick corky bark . 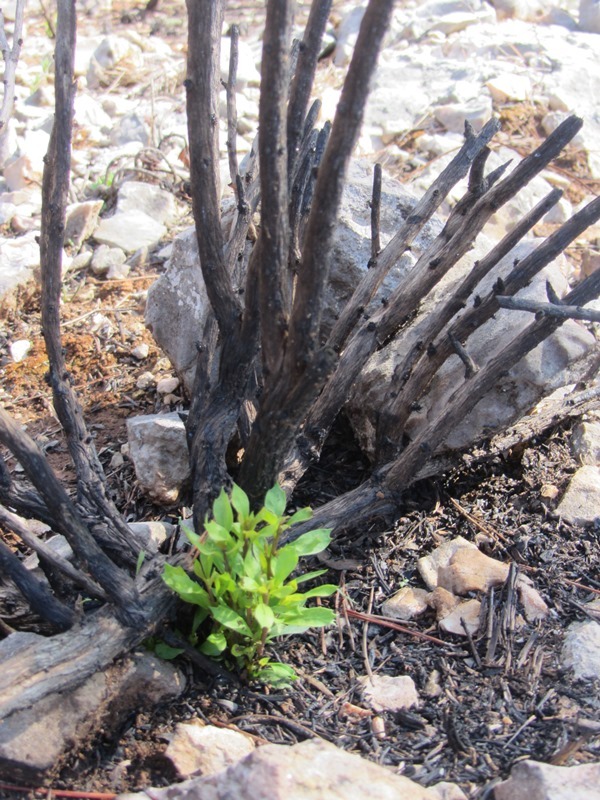 Epicormic resprouting has appeared in different lineages and on different continents and thus it is an example of convergent evolution in fire-prone ecosystems. 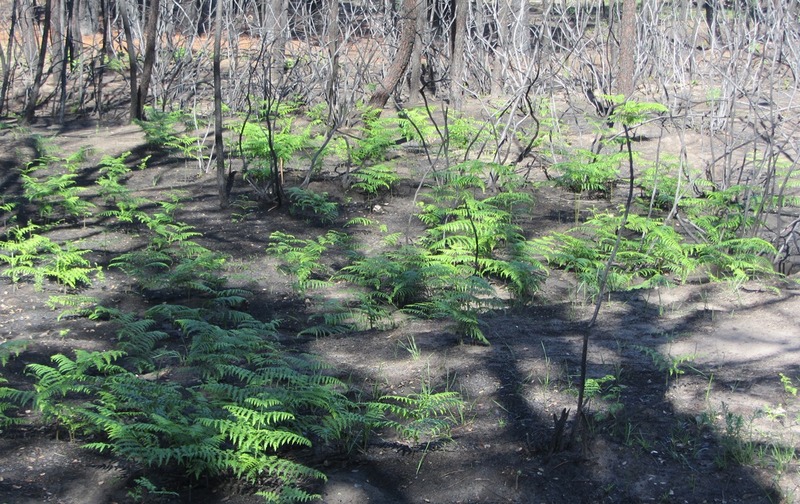 It is an adaptation to a regime of frequent fires that affect tree crowns. It has probably been favoured where productivity is sufficient to maintain an arborescent growth form, fire intensity is sufficient to defoliate the tree canopy crown, and fire frequency is high (in conifers, too high for serotiny to be reliable) . 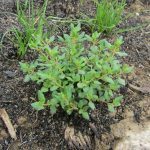 Given the high resilience of forest and woodlands dominated by epicormic resprouters, these species are good candidates for reforestation projects in fire-prone ecosystems . 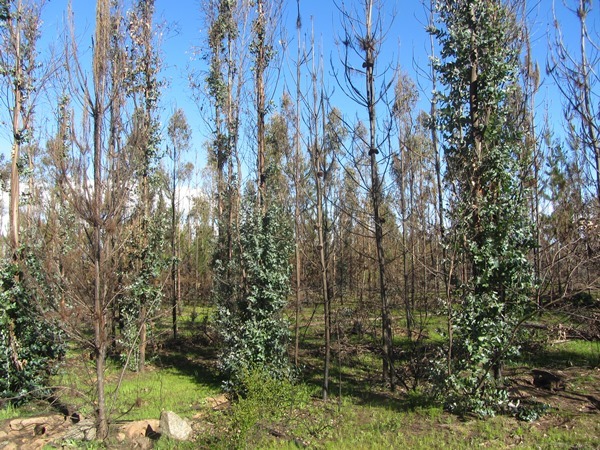 Figure: Examples of postfire epicormic resprouting after a crown fire from very different lineages: (A) Eucalyptus diversicolor 18 months after fire in Western Australia. 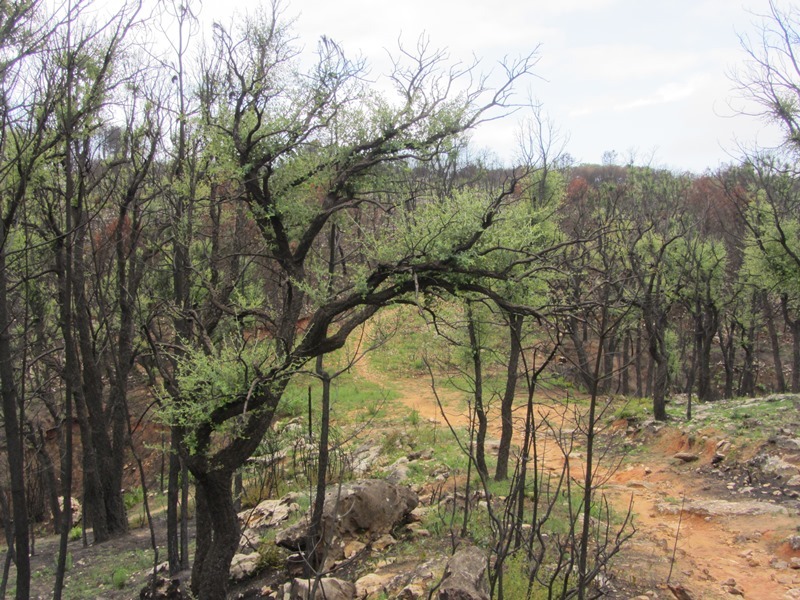 (B) Quercus suber woodland 1.5 years postfire in southern Portugal. 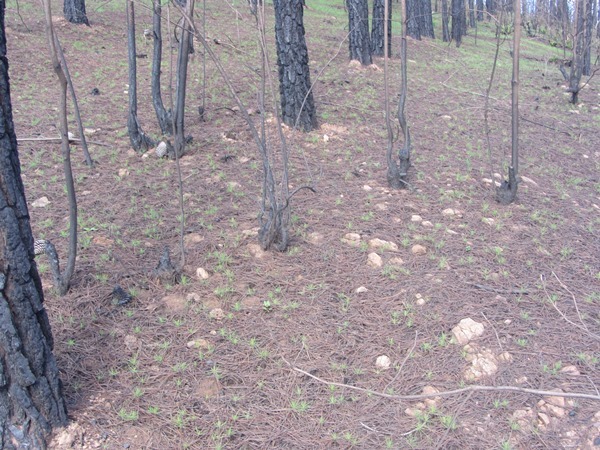 (C) Pinus canariensis woodland a few years after fire; (D) epicormic resprouts of P. canariensis 3 months postfire. Photos by G. Wardell-Johnson (A); F.X. Catry (B) and J.G. Pausas (C, D), from . The last post was about Pinus brutia  from the Eastern Mediterranean basin. Another pine of the mediterranean group (Pinaster group) is Pinus canariensis, endemic of Canary Islands, in the north west of Africa (in the Atlantic). P. canariensis have a thick bark and resprouts vigorously from stem buds (epicormic resprouting) after crown fires. 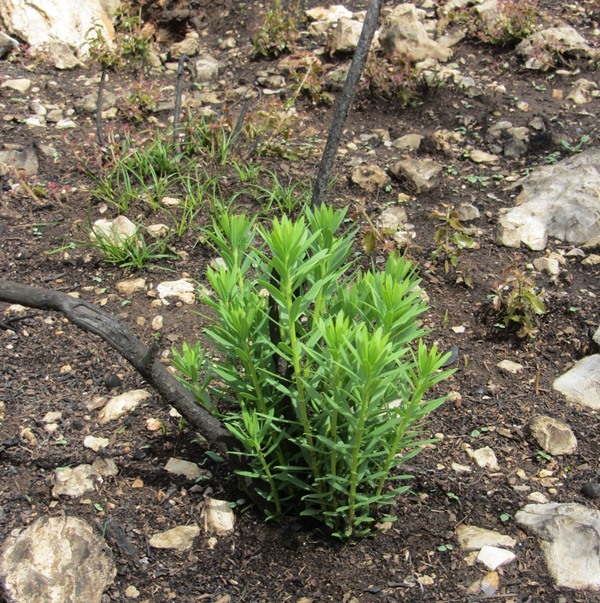 In addition, it produce serotinous cones, a clear adaptation to recruit after fire [2,3]. 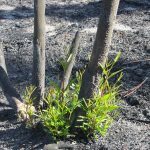 Very few other trees have strong adaptations to both survival and regeneration postfire; P. canariensis is among the best fire-adapted trees in the world, likely to survive very different fire regimes. Pictures of Pinus canariensis (by JG Pausas except mid-right from NASA). 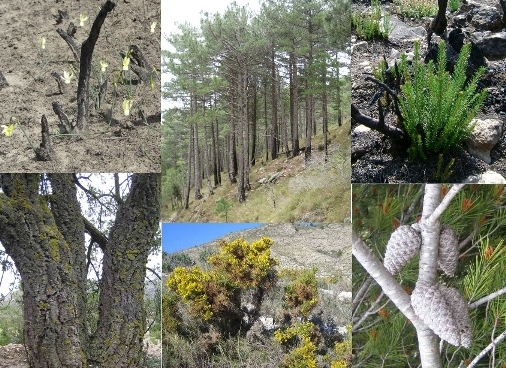 · Top-left: 5 years after a crown-fire (La Palma, Canary Is.). 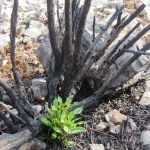 · Mid-left: plantation 2 years after fire (Vall d’Ebo, Alicante, eastern Spain; planted in the 50s). 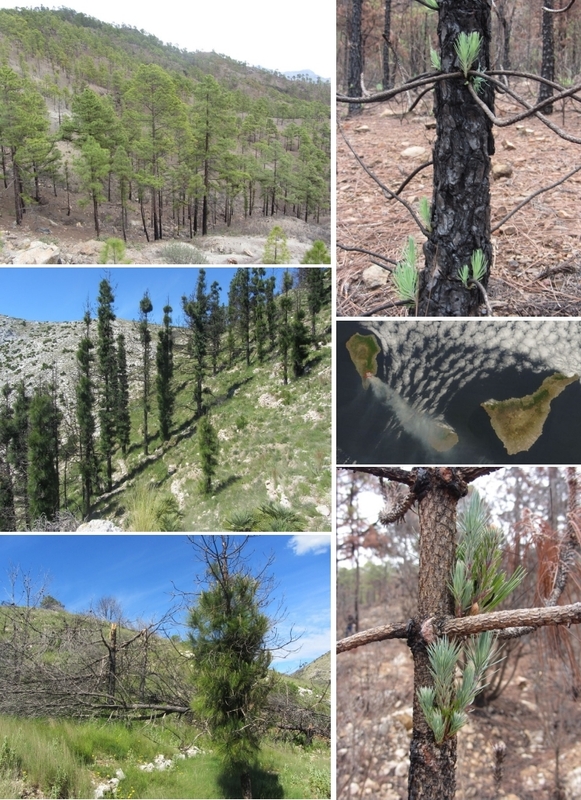 · Bottom-left: Contrasted response of Pinus halepensis (left; fire-killed serotinous pine) and P. canariensis (right, resprouting) two years after fire (Alicante, eastern Spain). 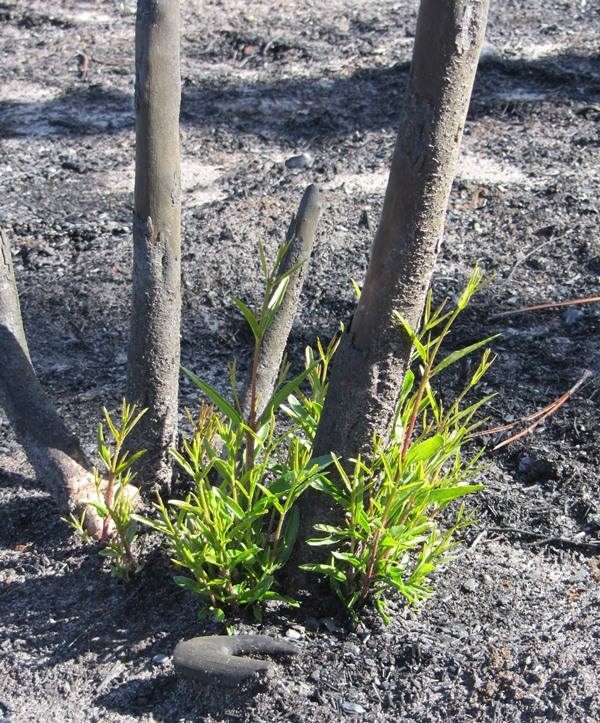 · Top-, bottom-right: epicormic resprouts 3 months after fire (Tenerife, Canary Is.). · Mid-right: a fire plume from a wildfire in La Palma (Canary Is.). 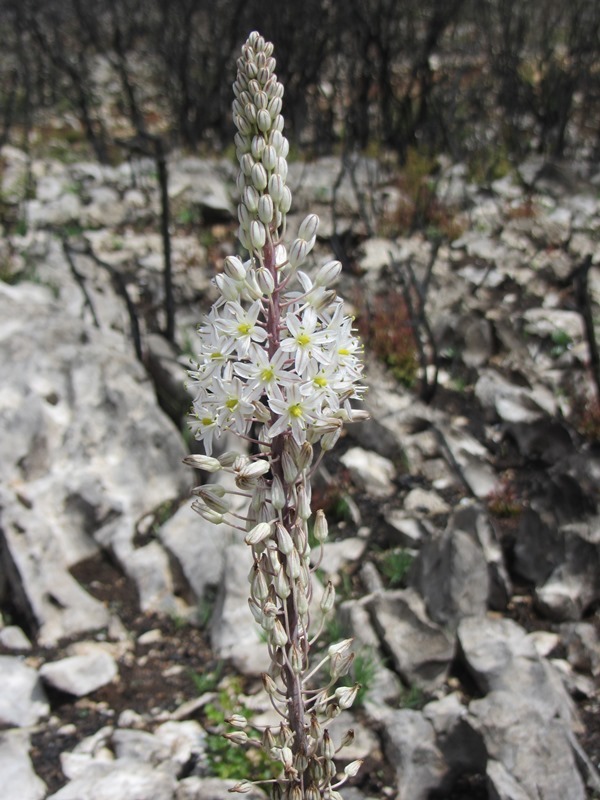 Few days ago a botanist colleague ask me whether there were some fire adaptations in the plants of the Mediterranean Basin, similar to those reported in other mediterraenan-climate regions. So I realised that researchers working on other topics may not be aware of the recent advances in this area. 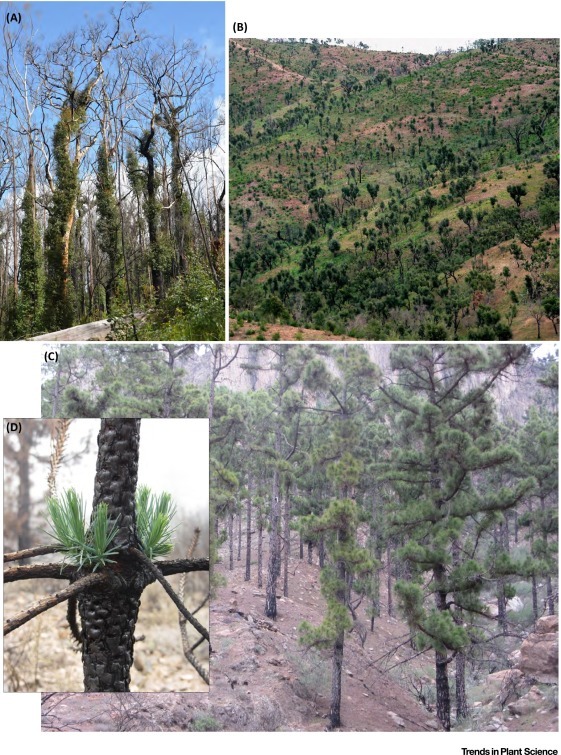 Here is my brief answer, i.e., some examples of species growing in Spain that show fire adaptations; this is by no means an exhaustive list, but a few examples of common species for illustrative purpose. You can find a description of these adaptations and further examples elsewhere [1, 2, 3, 4]. 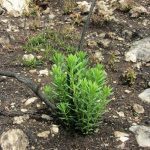 It is also important to note that plants are not adapted to fire per se, but to specific fire regimes, and thus some adaptations my provide persistence to some fire regimes but not to all . 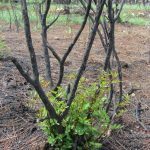 That is, species that exhibit traits that are adaptive under a particular fire regime can be threatened when that regime changes. 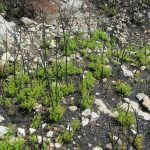 Enhanced flammability: Ulex parviflorus shows variability of flammability driven by different fire regimes  and under genetic control . 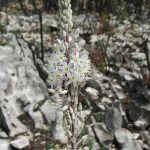 Many Lamiaceae species have volatile organic compounds that enhance flammability (e.g., Rosmarinus officinalis ). Savannas are typically ecosystems dominated by grasses with a variable tree density (e.g., ). However, the savanna biome is very large, it occurs in different continents, and includes a large variability in the vegetation structure and composition. Fire and herbivory are the main disturbance factors shaping savannas worldwide and because the different climatic conditions and the different evolutionary histories among different savannas, fire and herbivory regimes also varies among savannas. Because plants are not adapted to fire and herbivory “per se” but to specific regimes of herbivory and fire , we expect different strategies to cope with these disturbances in different savannas. 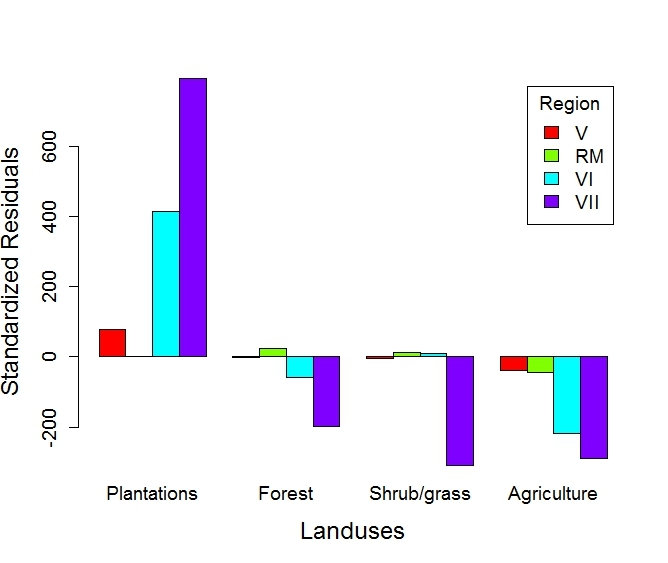 In this framework, we have recently compared savannas from Africa and from South America (afrotropical and neotropical savannas respectively) : Afrotropical savannas have a dryer climate and are more intensely grazed than neotropical savannas, and thus the amount of available fuel is typically lower in afrotropical than in the neotropical savannas. Consequently fires tend to be more intense in neotropical savannas. 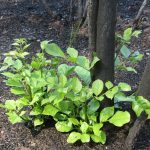 In afrotropical conditions, young woody plants tend to grow quickly in height to soon locate the canopy above the ﬂame zone before the next ﬁre, and above the browsing height. Thus these plants tend to have a pole-like or lanky architecture (the lanky strategy). In contrast, in neotropical savannas where herbivory pressure is lower they require a thick corky bark for protection against relatively intense fires (the corky strategy) . Despite the two fire escape strategies appear in both Africa and South America, we suggest that the lanky strategy is more adaptive in afrotropical savannas, while the corky strategy is more adaptive in neotropical savannas . Figure: Diospyros hispida A.DC. 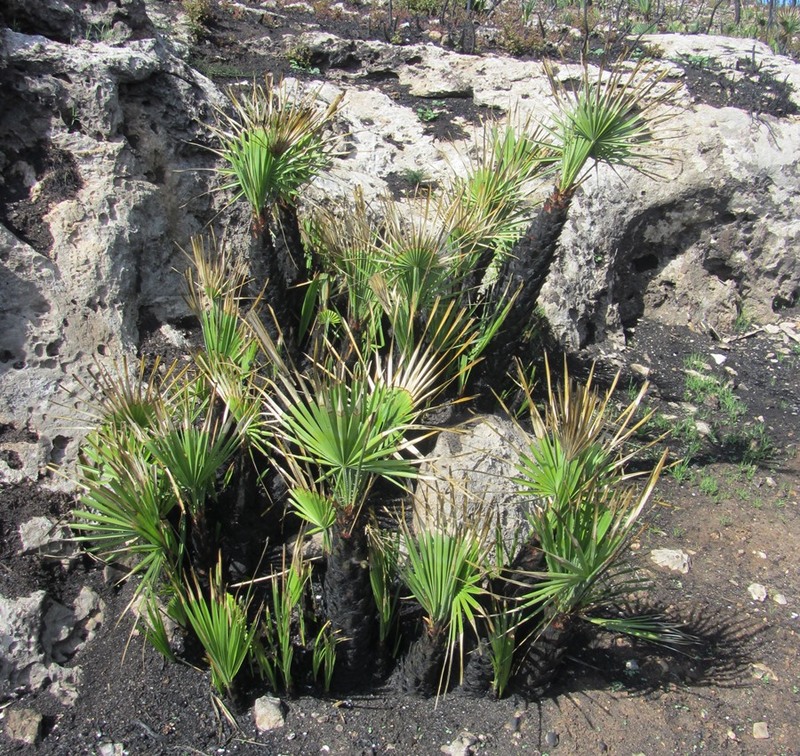 (Ebenaceae), a South American example of a plant with the corky strategy. Although the trunk was fully burned one year earlier (dark branches and trunk), the bark protected the lateral buds which enabled epicormic resprouting and the formation of lateral resprouts (light grey branches). 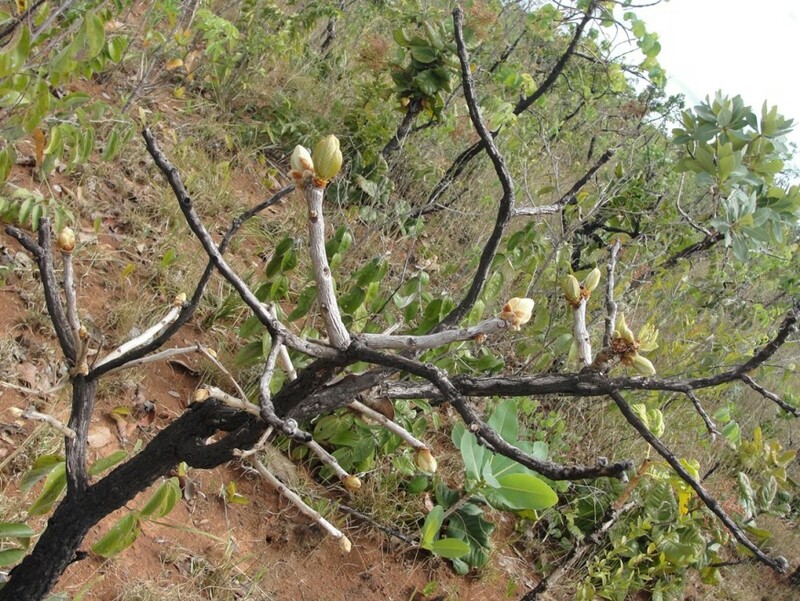 This photo was taken in Emas National Park (cerrado ecosystem, Brazil) at the beginning of the rainy season (2011) when this deciduous plant starts to produce new leaves (Photo: V.L. Dantas). For an example of the lanky strategy see . Archibald, S. & Bond, W.J. 2003. Growing tall vs growing wide: tree architecture and allometry of Acacia karoo in forest, savanna, and arid environments. Oikos, 102: 3-14. Cork oak (Quercus suber) is a strong fire-resistant tree species thank to is very thick and insulating corky bark [1-4]. 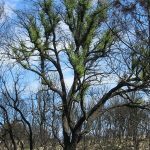 In fact it is the only European tree with the capacity to resprout from epicormic buds in the canopy after an intense crown-fire . However, the bark of the cork oak is periodically harvested for cork production (mainly for bottle tops but also for other uses, ) and thus bark harvesting increases the vulnerability of the tree to fire. 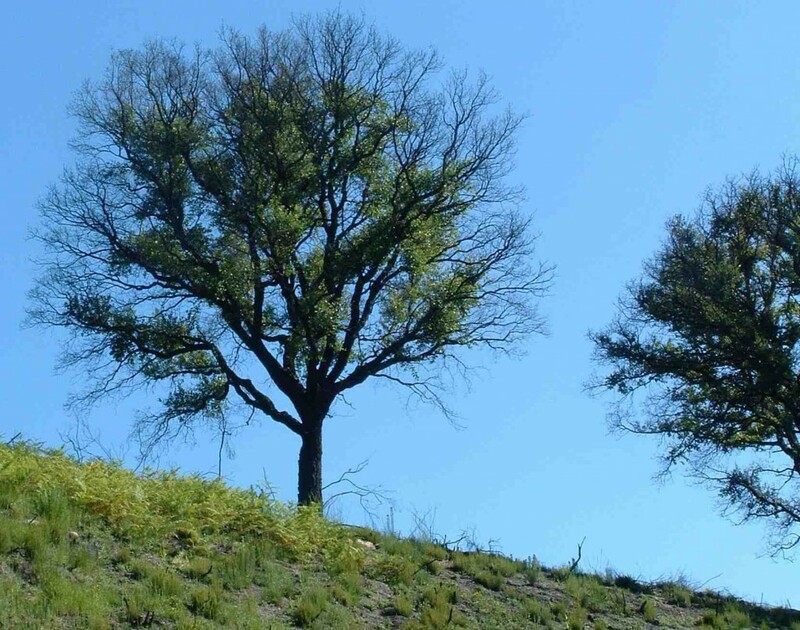 In a recent paper we quantified the response of cork oak (tree mortality, stem mortality, and crown recovery) after fire . 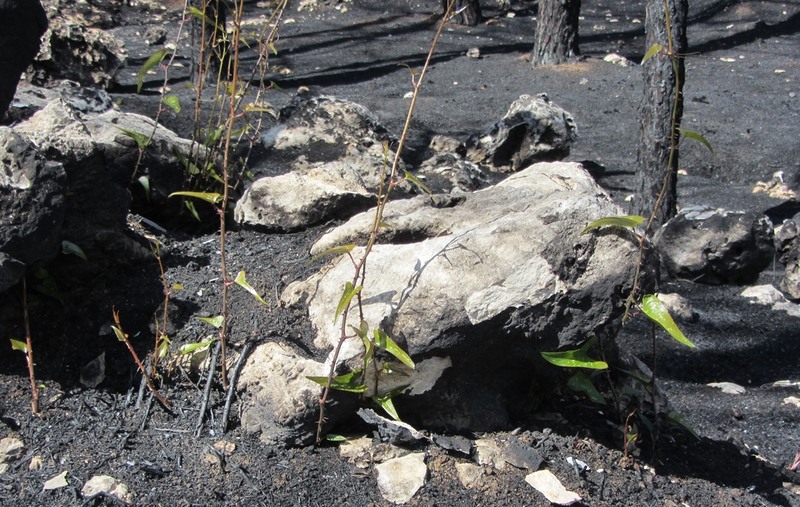 The results showed that fire vulnerability was higher for trees with thin bark (young or recently debarked individuals) and decreased with increasing bark thickness until cork was 3–4 cm thick. This bark thickness corresponds to the moment when exploited trees are debarked again, meaning that exploited trees are vulnerable to fire during a long period. Exploited trees were also more likely to be top-killed than never-debarked trees, even for the same bark thickness. Additionally, vulnerability to fire increased with burn severity and with tree diameter, and was higher in trees burned in early summer or located in drier south-facing aspects. All these aspects need to be considered when managing cork oak woodlands specially nowadays that fire activity is increased . Increasing the length of the cork harvesting cycle would increase the time during which the trees have a thicker bark and are better protected against fire injury. Since cork is the main economical income from these forests, stopping bark exploitation might be unrealistic in most cases. 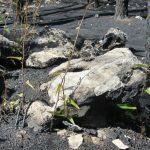 However, in fire-prone areas where conservation and tourism are the main objectives, stopping bark explotation would likely be the most effective option to increase ecosystem resilience to fire. The valorisation of many other services provided by cork oak forests  could create economic incentives to decrease the bark-exploitation dependency of these systems in the future.